On the windy East Coast of South Africa, we find an exceptional before and after project for your perusal today. 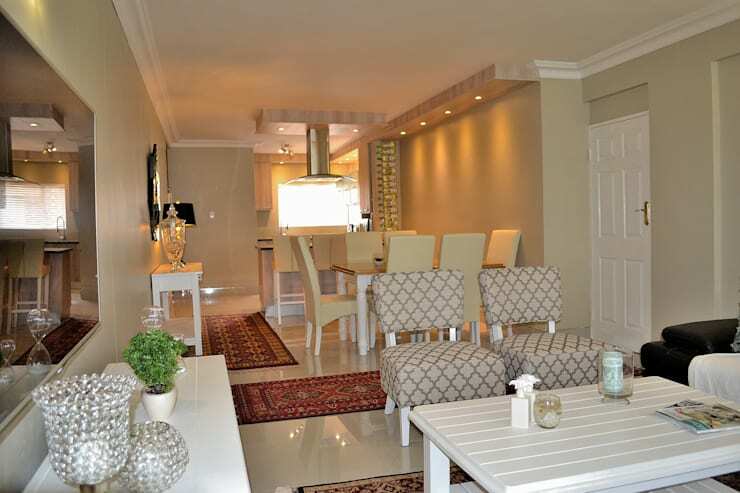 Exhibiting the best of local talent, we will see how a bland and boring old beach condo in Port Elizabeth is transformed into a stunning and stylish holiday home that anyone would envy. 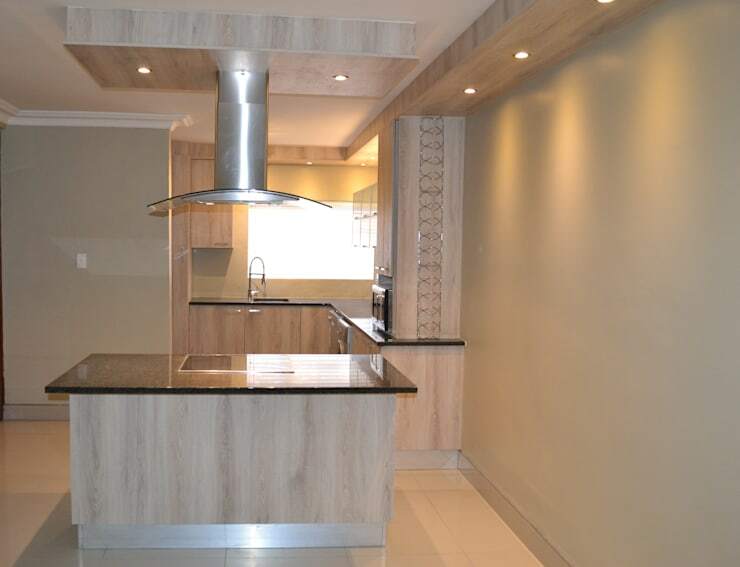 The talented interior designers and decorators involved in this project come from her Oscar Designs, a company based in the Friendly City as well. This group of creatives are known for their exceptional renovation work and the superb interiors they create. As we will see today, this apartment is no exception to this reputation. We are sure you will agree that the transformation of this flat has made worlds of improvement. Let's explore this project! 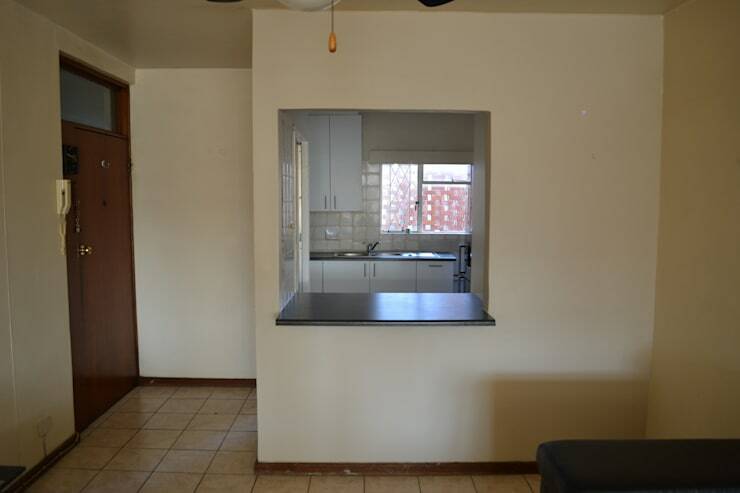 Here we can see the old kitchen of the untransformed apartment, seen from the living room area of the flat. From this perspective, we can see that the kitchen is of very limited dimensions. We can also see a old-style counter space that connects the kitchen to the living room, which does allow for some dialogue between the spaces, but is still quite restricting in the overall dimensions of the space. We can definitely imagine how this space can be utilised much better. The new kitchen space looks like an entirely different apartment, as if we had been transported many years into the future. The renovated kitchen space loks natural as well as contemporary, with a few industrial touches in conjunction with the use of wood tones and earthy colours. We can also see that the confining walls around the small kitchen space had been taken down opening up the space to the larger living area. This type of design is more appropriate to modern homes, and gives a greater sense of freedom and movement in the flat. The original living room, as we can see it in this image, leaves way too much to be desired in terms of functionality and aesthetics alike. The bland space has absolutely no visual appeal, and the since furniture suit in black leather is far from beautiful or even functional in its bulky arrangement. Who would feel at ease or relaxed when walking into this boring area?! Now, what a change! 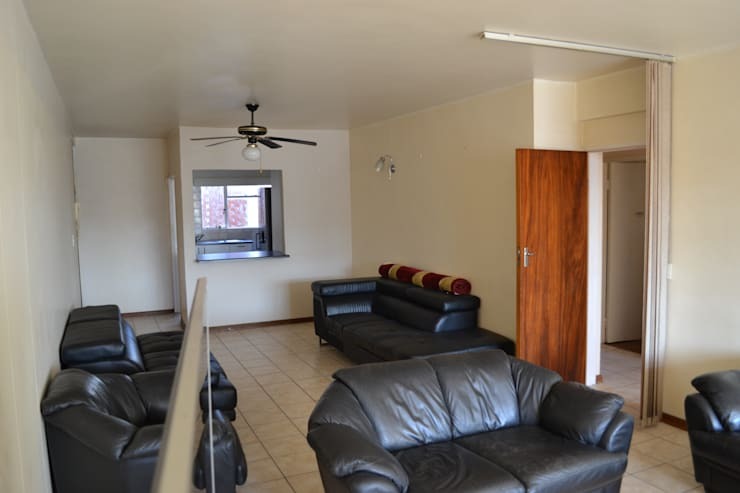 The reformation of the larger living area is certainly the star of the show, as we can see many changes had been made to perk up the plain apartment. Next to the kitchen area, we can see that the designers installed a dining space, complete with spacious dining table and a complement of six dining chairs. We can even see a buffet table to the side against the wall. Closer to our perspective in the image, we can see a lounge area, which includes a coffee table, some armless chairs, and a console table to host the television. This ensemble of furniture is much more practical and is sure to meet the needs of inhabitants. Although the use of furniture is much better in this transformation, the decoration is certainly what sets this area apart. The designers included luxurious Persian rugs and glass elements t give this room a rich appearance. The lighting is also more strategic, with perimeter light fixtures carrying the design. Lastly, we have the small bathroom of the house. We don't need to see much more than the corner of this room to know that it is out of sync with time and design trends. 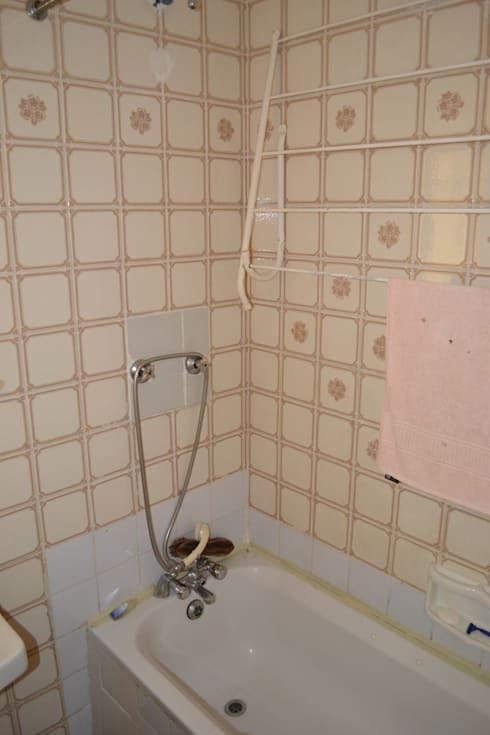 This dilapidated image of old, worn tiles that are entirely irrelevant gives us a good indication of the poor state the bathroom was in before intervention. 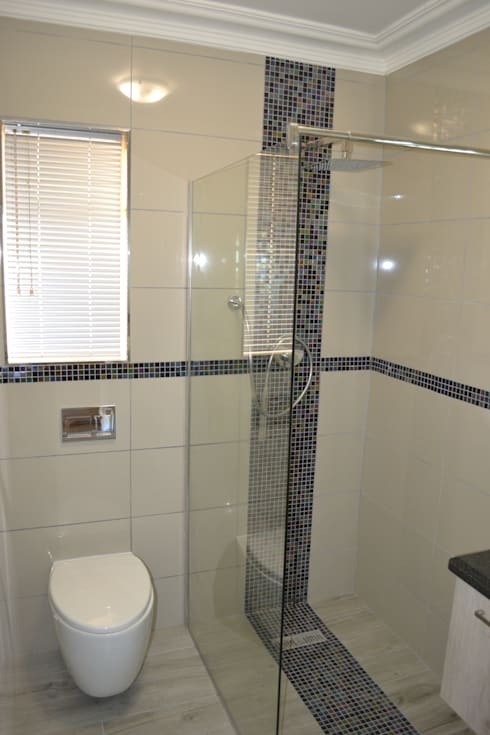 Fortunately for the owners, the professionals at Oscar Designs knew exactly what they were doing, as we can see in this after image of the bathroom space. The ancient tiles had been removed and replaced with bright, sparkling white ones, as well as with a complement of glistening small ones. These strips of mosaics easily transform this small bathroom into something beautiful, and should not be as expensive as other renovation solutions. This is very exciting to us, as we are always looking for ways to improve small bathrooms on a budget here on homify. This was clearly a radical transformation, but the results were absolutely worth it. Let us know what you thought of this transformation in the comments below.